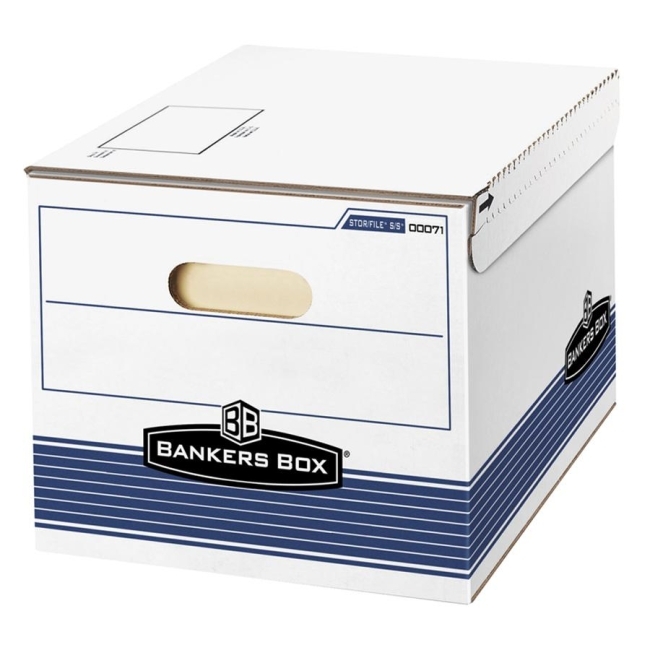 Bankers Box is the ideal box for shipping files or securely storing your confidential records. With double-bottom, double-end, single-side construction, this 2-in-1, extra strength specialty box is resilient enough for shipping and features an adhesive strip for a secure box seal without tape. Adhesive strip seals box securely for shipping, preventing tampering. Once shipped, top lid tears off to reveal flip-top lid for instant storage. Reinforced hand holes make carrying and stacking easy. Reusable box is built for moderate use and high stacking needs. Ideal for occasional access needs. Box stacks up to five units high and withstands 500 lb. of stacking weight. Storage box contains 65 percent recycled material.